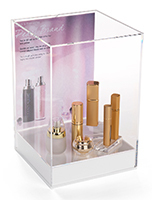 More Color & Light Type Options Available! 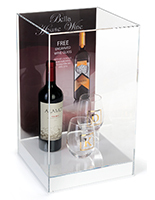 More Overall Width & Color Options Available! 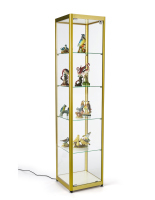 More Overall Height & Color Options Available! 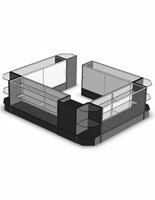 More Light Type Options Available! 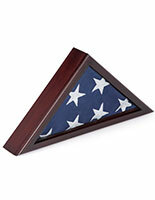 More Color & Flag Size Options Available! 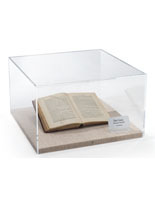 How do you highlight items while protecting them from dust and theft? 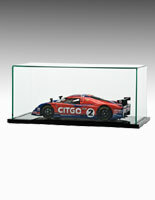 These display showcases feature high visibility designs for exhibiting merchandise, artwork, and commemorative flags. 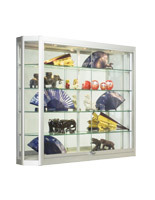 Cases are available in a number of designs to serve the different needs of retail stores, restaurants, collectors, and museums. 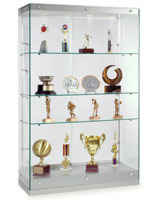 Our large selection of display showcases includes locking cabinets, illuminated displays, and countertop model holders. 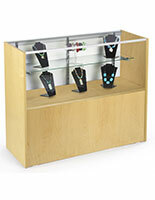 These fixtures are made for a variety of placement options as well. 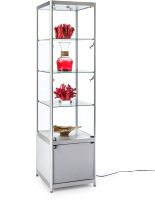 Discover display showcases with floor standing, countertop sitting, or wall mounted designs to fit in your interior, no matter how much space you have. 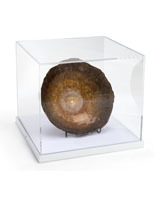 What types of exhibit cases are offered here? 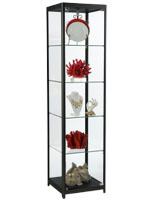 Tall display showcases are excellent for maximizing visibility. 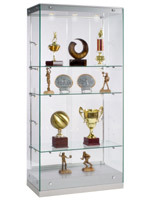 These cabinets are available in a number of constructions including the modern frameless design that creates a full view presentation. 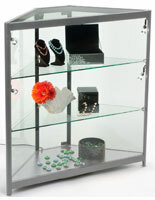 This style is mostly made out of tempered glass for visibility from any angle. 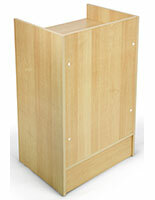 Narrow tower fixtures are great for retail stores that need an upscale merchandiser with a small footprint. 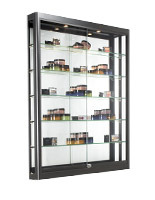 Many of our large glass cabinets additionally include lighting to bring extra attention to the contents inside. 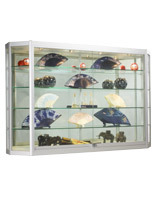 There are a number of illumination options available: top or side lights, halogen or LED, and fixed position or adjustable. 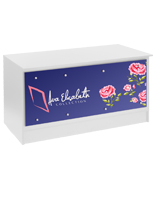 Our cash wraps and counter showcases are perfect for retail stores. 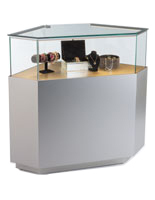 This furniture creates a convenient countertop for handling customer transactions. 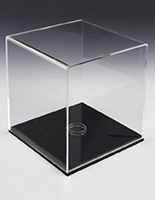 There are a number of styles available, including simple cash wraps just for holding the cash register and tempered glass cabinets that can hold lots of high-interest merchandise. 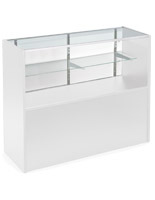 Most counter cases come with shelves and pull-out drawers for holding supplies. 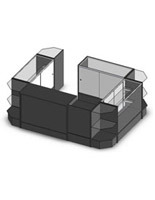 Large department stores can choose our configurations that are made of multiple units for the ultimate POS area. 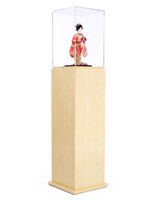 Museum pedestals and tables have an elegant design that's often featured in historical societies and art galleries. 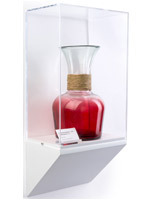 With their simple appearance, they highlight the exhibit without distracting from it. 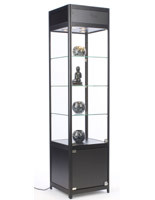 Our pedestal cases feature a slim fabrication that's excellent for highlighting a single piece. 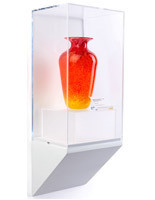 Whether it's artwork, a historical artifact, or a collector's item, these modest fixtures make it stand out. 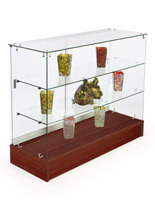 The longer museum tables have more room for holding multiple exhibits, yet they have the same simple elegance that brings attention to their contents. 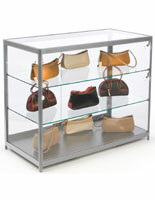 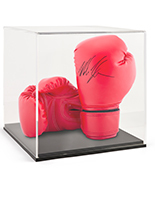 Our model cases are perfect for collectors. 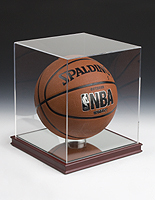 These affordable countertop holders are made for smaller items, like collectible action figures, sports memorabilia, and glass figurines. 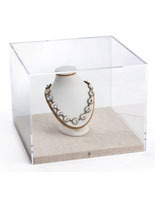 Wall mounted and countertop shadow boxes are another great option that give keepsakes a memorable presentation. 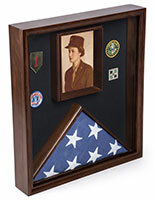 This style is made with MDF on the top, bottom, and sides, framing the item inside. Flag holders are ideal for commemorating years of military service or remembering a loved one who served. 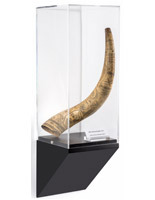 Our wooden banner displays are available in a number of attractive finishes and are made for both 3' x 5' and 5' x 9.5' ensigns. 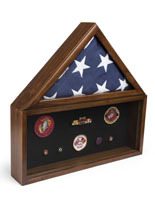 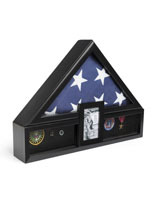 Other flag cases have extra room for featuring photographs, medals, and other military honors. 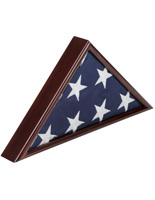 Hang these military memorabilia holders on a wall or place them on a tabletop or mantel. 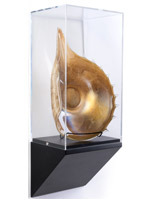 Our showcases are great for merchandising, exhibiting artwork and artifacts, or just showing off your collection. 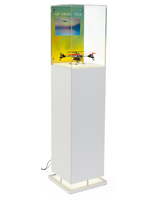 While they're used for a wide variety of applications, it's important to find the right model that suits your needs. 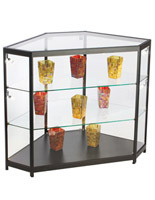 If the holder will be in a public area, it should lock to prevent theft of valuable merchandise and artwork. 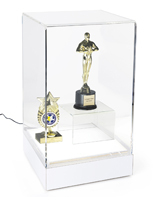 Lighting is required not just in dark rooms, but places where you're fighting to get people's attention. 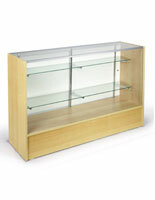 Browse models with height adjustable shelving if you need to exhibit especially large wares. 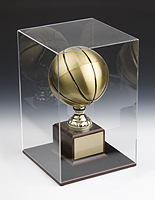 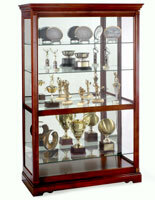 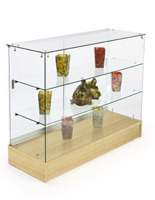 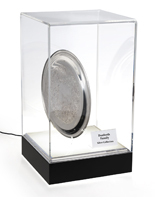 Portable display cabinets are excellent for bringing to events and creating a professional presentation. 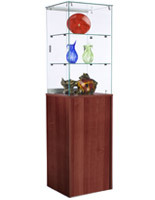 Our large catalog has commercial fixtures for any businesses, all offered with bulk pricing and fast shipping.